Hot mess in aisle 1 | Do the twisted. Honey, can you stop at the store and pick me up a pair of size 9 Jellies, a 6-pack of Purple Haze, 2 Kumquat, Horizon Organic Milk, the entire shelf of Heinz Ketchup, and Brianna’s Ginger Mandarin dressing? Oh and don’t worry about running all over the place. Just visit aisle 1. I would hate to see what a clean-up on Aisle 1 would look like. catsup? Really? C’mon people, KETCHUP. 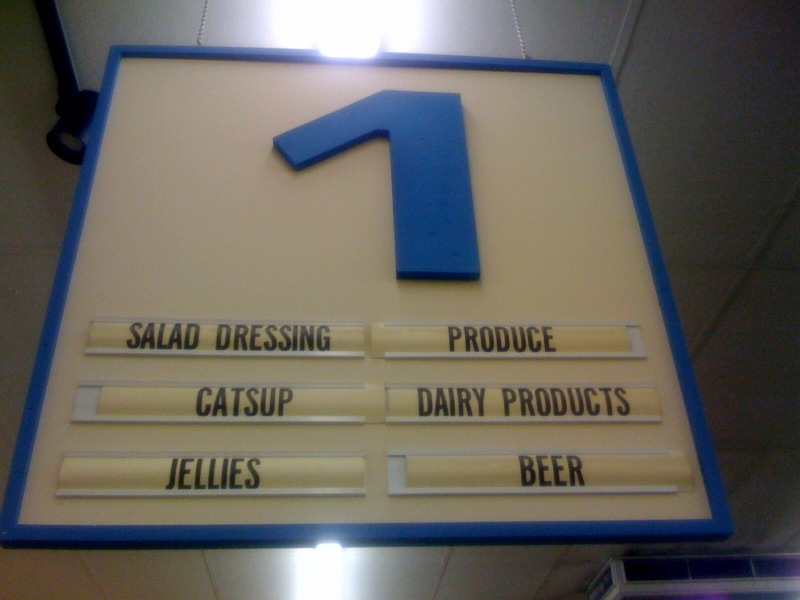 wtf is catsup? It just sounds wrong…. Jen, meeeeeee too. It’d probably look like a USC student’s toilet after a 6 kegger. You know, cause that’s how we roll. Miguel, I could have blasted them for hours for Catsup. That’s what initially caught my attention. Thank goodness we have you to blow off the steam. When it comes to KETCHUP, we obviously have each other’s back. That’s good to know.